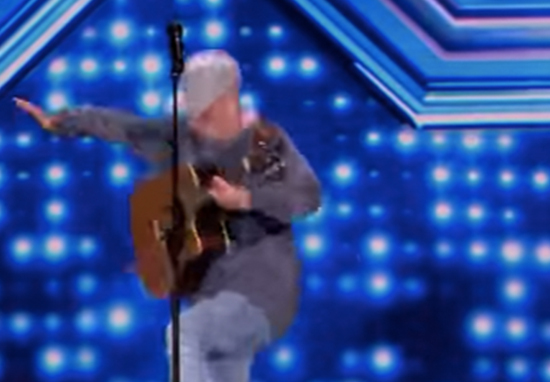 One X Factor contestant has made a very dramatic exit; falling from the back of the stage during his performance. Hoping to secure a spot at the judges’ houses, 20-year-old singer and guitarist, Tommy Ludford, gave a lively and promising performance during the ‘Six Chair Challenge’. Strumming away on his acoustic guitar, Tommy looked like a natural and the judges and audience members alike appeared to be thoroughly enjoying his performance of his song Dipping Biscuits. However, no sooner had he finished plucking the strings, the Sussex man took a misguided step backwards and tumbled off the stage – following in the clumsy footsteps of celebrities such as Madonna and Gemma Collins. The judges appeared deeply concerned, wide-eyed with shock as a swearing Dermot O’Leary ran over to help him out. The studio erupted with panic at the prospect of the talented young man being injured. One Direction’s Louis Tomlinson wore an expression of pure horror before rushing to Tommy’s side, while Take That legend, Robbie Williams, clapped a hand to his mouth. Even the cynical Simon Cowell, who’s surely seen it all by now, appeared genuinely alarmed for Tommy’s welfare. Fortunately, Tommy arose from the back of the stage with his fist raised and a big grin on his face. A true star, it’ll clearly take more than a fall to bring this lad down. The audience cheered and applauded at the sight of good humoured Tommy; uninjured and resilient after an extremely tough performance. Disastrous moment aside, it seems fans of the ITV talent show have truly ‘fallen’ for the down-to-earth (ahem) contestant, offering him plenty of support. He rises like the Phoenix. IM SORRY FOR LAUGHING i hope you didn’t hurt yourself tho!! Kitchen porter by day, Tommy is a dab hand at writing his own songs, wowing the judging panel with his original song, Kingpin. His audition won him four big yes votes, even gaining him the respect of Cowell, who’s not always been a fan of guitar music. It was amazing and definitely the most surreal experience in the world. I was really nervous beforehand but once I got on the stage I just got into the zone. Will Tommy have earned himself a chair and a place in the next round? Find out in tonights episode (September 30), which will air at 8pm on ITV.